The central heating at the Freedom building has been non-functioning since the fire, and we’ve had quotes ranging from £3,000 to £5,000 to get it fixed. Whilst we work on getting an official quote to work towards I’m starting to raise money, on the basis that either way its going to be a lot. 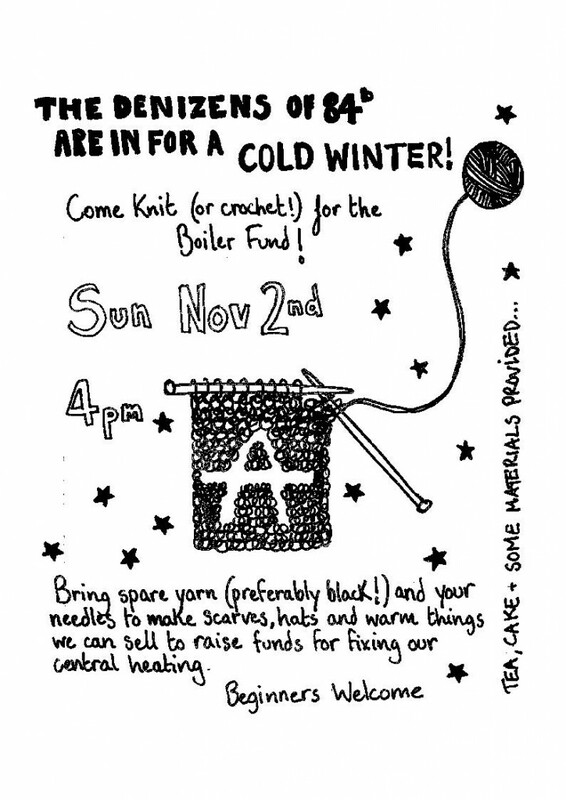 To start with, we’re having a knitting and crochet evening, where we’ll make some anarchic scarves and that to sell for the boiler fund. There will be tea, vegan baked goods and beer available (for donations if yeh can), and I’ll wack the heater on a few hours before so its toasty (ish). 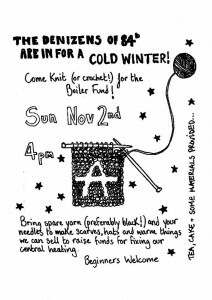 Bring your scrap wool and needles. Some stuffs will be provided, so if you’ve got none don’t let it put you off.